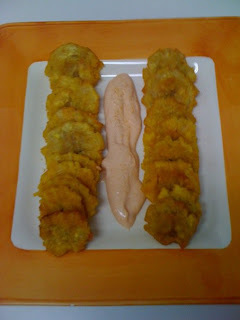 Coqui the Chef: How to make mayo ketchup! How to make mayo ketchup! Have you ever heard of mayo ketchup? Yes or No? If you have then you will love this homemade recipe but if you didn't then let me tell you. It is a dip Puerto Ricans love, goes well with tostones (fried plantains) but like all the fried foods eating in moderation is always the best way to go. There are many food brands who make mayo ketchup but nothing is better that making it at home. They're fun to make and a lot healthier. For instance, ketchup has lots of sugar added even high fructose corn syrup, preservatives and additives you can't even pronounce! So let's eliminate that off our shopping list instead buy wholesome natural ingredients and make your own mayo ketchup. Make sure ingredients are at room temperature before blending. Add egg yolks, oil and lemon juice into a blending container. Place your hand blender at the bottom of the container. Turn blender on and within seconds you will see mayo start to form. Make sure you keep the blender at the bottom of your container and move up slowly so the oil incorporates evenly. If you mix everything together at once, the consistency will be too runny. Once the mixture feels like real mayo, add salt and pepper to taste. Place all ingredients in a bowl and mix well. Pour into a glass jar and store in the fridge. According to your taste and consistency-- mix some homemade ketchup, mayonnaise and finely chopped garlic. VOILA! SABROSO!